Celebrating and commemorating WCU's 125th anniversary, Hunter Library has "launched" a new digital collection of historical university photographs chronicling WCU's history. The collection is entitled "Western Carolina University: Making Memories," and currently features nearly 100 photographs from the library's Special Collections unit. The collection can be found through the Digital Collections link and the library's home page. Charles Turner, a young military veteran and biology major will be graduating this May. He recently participated in an NIH Intramural NIAID Research Opportunity and just found out that he will be working at the NIH Rocky Mountain Labs facility upon graduation as part of a post baccalaureate -fellowship. This is a first for WCU. The success rate for this highly competitive program this year was ~3%. Academic Affairs first e-newsletter was sent out at the beginning of April to good reviews and comments. Sections will be written each month (not including the summer months) to keep the University community up on important issues in Academic Affairs. 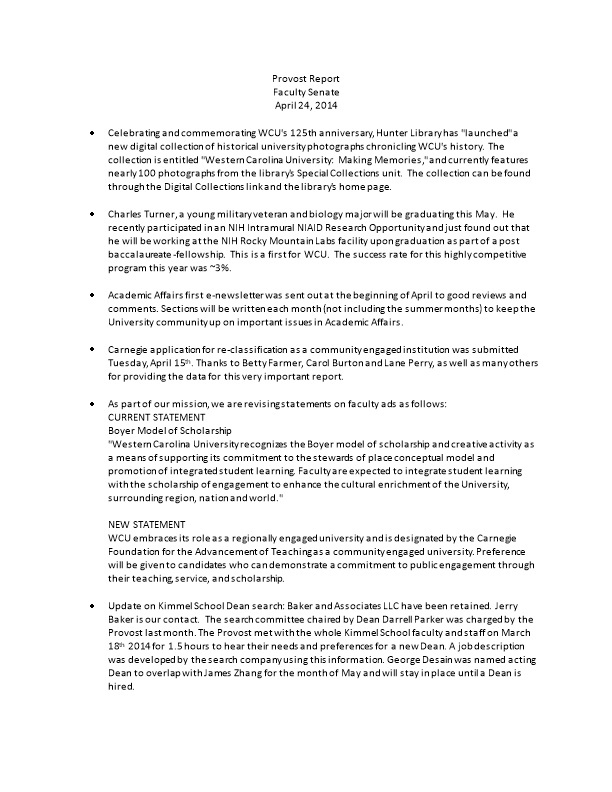 Carnegie application for re-classification as a community engaged institution was submitted Tuesday, April 15th. Thanks to Betty Farmer, Carol Burton and Lane Perry, as well as many others for providing the data for this very important report. "Western Carolina University recognizes the Boyer model of scholarship and creative activity as a means of supporting its commitment to the stewards of place conceptual model and promotion of integrated student learning. Faculty are expected to integrate student learning with the scholarship of engagement to enhance the cultural enrichment of the University, surrounding region, nation and world." Update on Kimmel School Dean search: Baker and Associates LLC have been retained. Jerry Baker is our contact. The search committee chaired by Dean Darrell Parker was charged by the Provost last month. The Provost met with the whole Kimmel School faculty and staff on March 18th 2014 for 1.5 hours to hear their needs and preferences for a new Dean. A job description was developed by the search company using this information. George Desain was named acting Dean to overlap with James Zhang for the month of May and will stay in place until a Dean is hired. Update on Associate Provost for Academic Affairs search: Thus far there are 57 applicants for the position as a result of a national search. The committee, chaired by Dean Doug Keskula, has reviewed the applications; Skype interviewed 10 candidates, and is working on setting up the agendas to invite 3 candidates to campus in the next two – three weeks. Update on International Programs and Services: The Provost cancelled the search for the IPS Director while some reorganization within the unit occurred. The Provost met with the IPS and IEP units and discussed their needs in a Director and at the same time familiarized herself with the roles and responsibilities of each of the staff and faculty. The Provost asked Dr. Lowell Davis to be interim Director of IPS, allowing Jill Cargill the opportunity to move into the Director of IEP, for which she was originally hired. Dr. Davis is working on getting the personnel cross trained in a variety of needed operations. The Provost, in collaboration with the faculty and staff of the IPS and IEP units will generate a new Director position description and advertise nationally in the very near future.